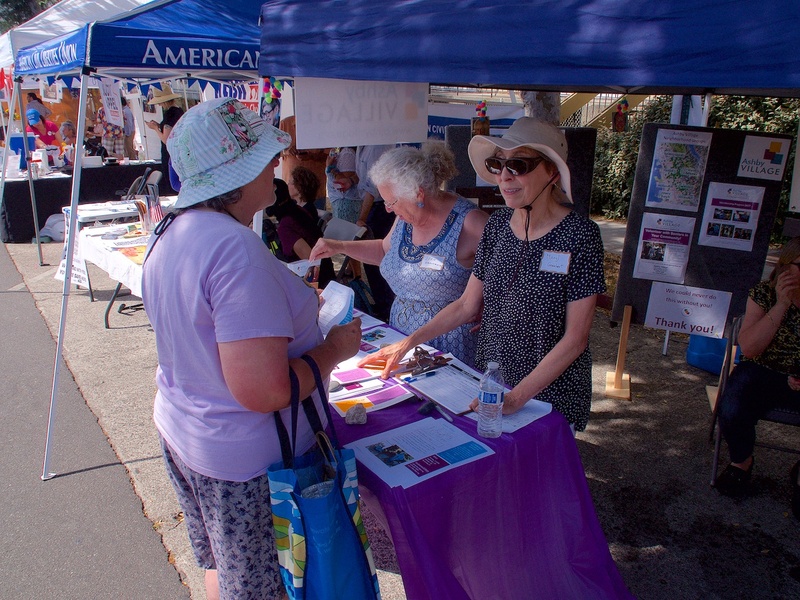 More than a dozen volunteers joined Manuela Pegoraro, Ashby Village Community Engagement Manager, on sundrenched Solano Avenue early on Sunday, September 10. The annual street party known as the Solano Stroll was about to begin. The team set up a booth (providing welcome shade) and assembled brochures and postcards for distribution. The goal for the day: to engage some of the quarter million people expected to stroll the avenue and to explain the Village’s place in the community. Which is to say: as a group of friendly, active people who partake of numerous activities and services focused on learning, health, and support. 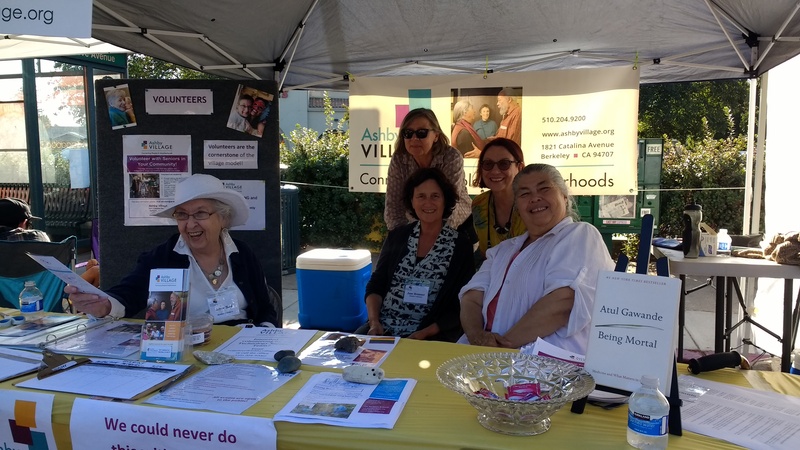 The City of Berkeley has recently been recognized as an Age Friendly City by the World Health Organization and AARP, and Ashby Village plays a key role in serving older adults both in Berkeley and in adjacent communities. Volunteers, including those at the Stroll and many others, help make the wheels turn. There was plenty of competition for gaining the attention of the mass of Solano strollers. Nearby booths were occupied by politicians, some in office and others hoping to join the scrum. Clubs representing a wide range of interests lined the avenue. Amplified music blared, and the aroma of garlic fries and sizzling chicken skewers filled the hot air. A crowd gathered around a boy with a huge snake curled about his shoulders. The intrepid Ashby Villagers pressed on. It was a chance to present to newcomers a succinct overview of Ashby Village’s role as a virtual community rather than the old folks’ home imagined by some who stopped by the booth. Several hundred brochures and postcards were distributed. Around thirty individuals provided contact information. They will receive callbacks from AV staff or volunteers along with an invitation to attend a living room chat or other event. 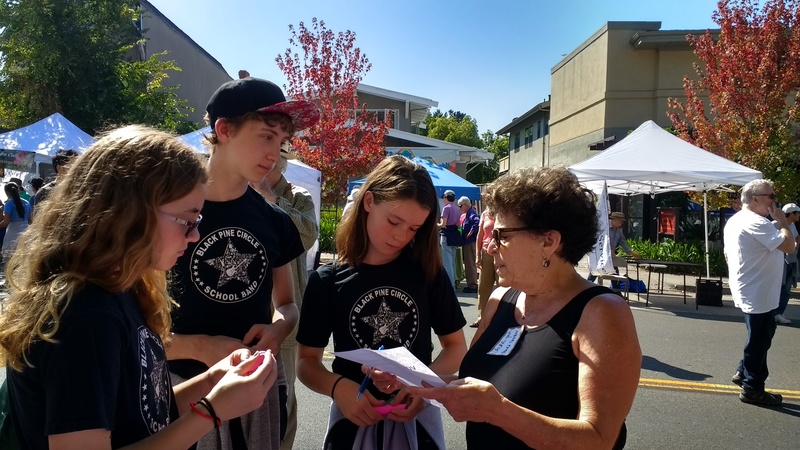 Young people who visited the booth but expressed no interest in joining Ashby Village due to their tender age were met with a ready response: come and volunteer! There’s plenty to do. Many thanks to all those who helped to set up and break down the booth and to spread the word about Ashby Village.